The 2019 Ford Ranger has a clean, handsome exterior design. 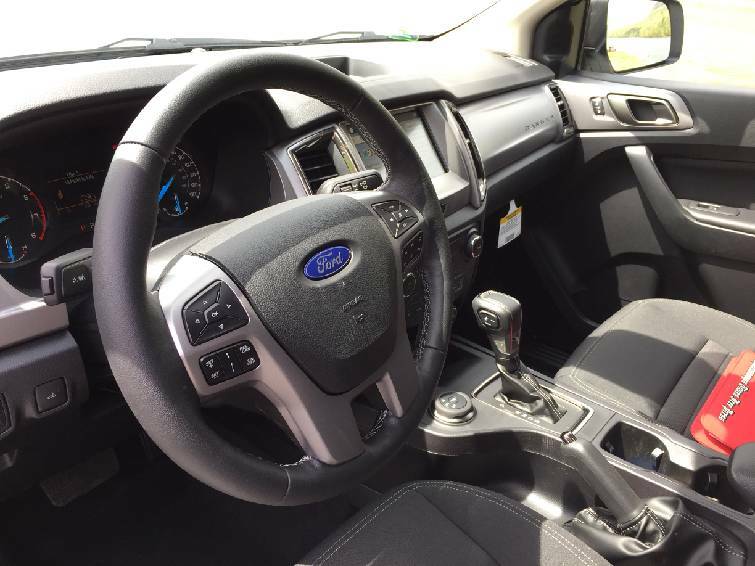 The interior of our 2019 Ford Ranger tester is shown in Ebony. Now, like the second-cousin you haven't seen since Memaw passed away, the Ranger is suddenly back — sporting a svelte new body, modern safety features and a work ethic that lets you pull up to 7,500 pounds. In the market for a new vehicle? To access hundreds of Mark Kennedy’s Chattanooga Test Drive columns visit www.timesfreepress.com/testdrive. The Ranger will have to wedge its way back into a segment dominated by the Toyota Tacoma, a mid-size truck with a near cult following among young males. There is also formidable competition from the GM twins the Chevy Colorado and the GMC Canyon. Domestic sales of mid-size trucks is over 500,000 a year, but the new Ranger promises to not only grab market share, but also to help grow the segment. 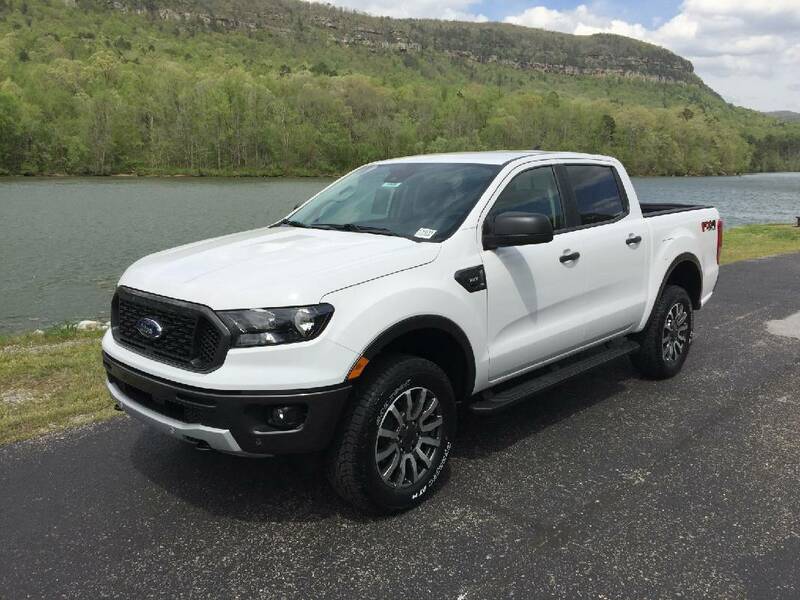 After a test drive in a 2019 Ford Ranger XLT Supercrew, courtesy of Mountain View Ford, we can attest to the fact that the Ranger is up to the challenge. The new Ranger will be a welcome option for drivers who don't want to wrestle a full-size truck like the Ford F-150 or Chevy Silverado. The Ford Ranger is easily more "parkable" than the big boys. Doug Cawood, new car manager at Mountain View Ford, says interest in Ford's new mid-size truck has been encouraging, especially among former Ranger owners who are eager to get a peek at Ranger 2.0. What they'll encounter is a modern, clean design and a universal 2.5-liter four-cylinder turbocharged engine mated to a 10-speed automatic transmission. The competition may cling to V-6 engines, but the four-cylinder Ford Ecoboost punches above its weight class. And with gas prices creeping up, our test Ranger's 24 mpg highway rating is a blessing. The 270-horsepower engine vaults the Ranger from zero-to-60 mph in under seven seconds. The 2019 Ford Ranger is a reboot of the blue oval brand's small truck line. Our Supercrew XLT tester seats five, with buckets in the front and a bench in the back. The Supercrew four-door is paired with a five-foot bed, which is sufficient for small jobs. The most basic 2019 Ford Ranger, in XL trim, starts at $25,395. Our upgraded XLT Supercrew has a retail MSRP of $42,620, which is admittedly in F-150 territory. Still, we believe there is a healthy market for a premium mid-size truck that presents and performs like the Ranger. Our tester includes more than $7,000 in options, including at $1,295 FX4 off-road package that features four-wheel-drive and multi-terrain driving modes. 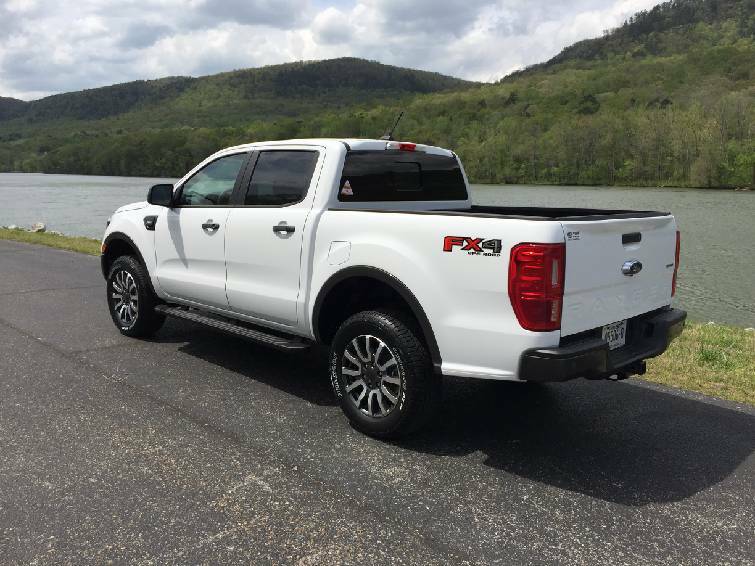 Our 2019 Ford Ranger Tester includes the $1,295 FX4 off-road package. One of our favorite features of our test truck is its forward visibility. On a test drive into Marion County tracing the Tennessee River Gorge, the Ranger offered excellent sight lines to take in Mother Nature's vistas. Actually, we found the compact design comforting — driving the Ranger you feel like you could lean over and touch the passenger door. Gauges are clear and the Ranger can channel a 4G WiFi hotspot. Also on our like list are: clear gauges, a handy dash storage tray, black running boards, a macho-looking gray grille, and near-perfect exterior proportions. At over $42,000 our tester has no push-button start. Hmm. Pulling through a McDonald's parking lot the truck jostled over uneven pavement, but out on the highway its ride is pure. If you are dubious about a truck with a four-cylinder engine, please schedule a test drive of the Ranger. The small-displacement turbo is solid muscle, like the heart of an endurance runner. With 8.9 inches of ground clearance the Ranger is never going to drive like a car, but then, you're buying a truck, right? If you were puzzled when the Ranger disappeared eight years ago, you should be cheered by the fact that it's back, better than ever, at your neighborhood Ford store.